Alicante international airport is one of the five most used airports in Spain . It has both national and international flights. The airport is situated in Elche with easy access to the whole of the Costa blanca region. If you wish to catch a taxi from the airport you should be aware that the queues can be long during peak times and so it is advisable to book a private transfer in advance or hire a car. If you ar a large group of people you also can can hire a 9 seats car.There are however other options for transfers from Alicante airport as the train or bus. * Tabarca Island – a noteworthy Marine Reserve, close to Alicante’s southeastern side, with panoramic views of the surrounding area . * Torrevieja: surrounded by salt lakes and as a result the climate is meant to be very healthy especially for people with arthritus. The harbor area has numerous restaurants, tapas bars and shops. The fresh fish restaurants are all along the area. Torrevieja has many attractive parks, gardens and squares where you can sit down and just relax. * Benidorm : You can found everything in the city, 5 km of sandy beaches, Poniente and Levante beaches. Nightlife ,. Even without speaking any spanish words you will fell as at home. Especially if you are on holidays with kid you can enjoy the parks around Benidorm, starting from Terra Mitica to Mundomar and Aqualandia, all parks offer a variety of attractions for all the family. * Moraira: known for the beauty of its small and familiar beaches, the important tourist resort of Moraira and the quality of the local wines, Moscatell white wine. * Javea: One of the most known town at Costa Blanca, nice beaches and spectacular paseo called Arenal where you can drink, eat or shopping, we recommend you Carnival bar. The long road between Javea port and Arenal is plenty of Chill Out bars, as Ibiza stile. If you like to make sport you can find, aquatic sports, tennis court, golf, and many others activities. * Denia: One of the most visited tourist attractions of Denia is the castillo (castle). The castle offers a wonderful view around the sea, the city and the backlands.Long beaches go along Denia cost with Chiringuitos on the beach. Head for the main central street, Calle Marques de Campo, is a wonderful place to make shopping sit and people watch – a Parisian-style tree lined avenue peppered with street cafes on both sides. 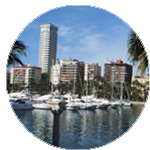 Nearby you can found the port, , tapas bars, pubs and seafood restaurants. You can reach easily the Balearic Islands, menorca, ibiza and Mallorca, by regular ferries from Denia or Alicante ports. If you are thinking of hiring a car , make the booking in advanced, so you will have a good price and you won´t remain without car , as prices and availability change very fast in Christmas, easter and summer. If finally you don´t need the car , you can cancel the booking free of charge. If you travel with your kids, ensure your baby seats. Order it in advance to avoid suprises on arrival. The main train station is located in the city center. All major spanish cities such as Madrid, Barcelona, Valencia and Seville have daily connections. Other trains connect the city with Asturias, the Basque Country, Valencia, Castilla, and Montpellier (France). You can rent your car on arrival to Alicante railway station, the car rental office are inside the railway station, so you can take your vehicle easily and fast. Remember, if you want to have a good rental price, book in advanced. 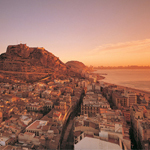 Alicante is a comfortable city to walk around: distances are short and it’s easy to get from one place to another. * You can visit all the beaches in the area including la Albufereta and the beautiful San Juan . The Cabo de las Huertas offers secluded rocky coves whereas naturist beaches can be found at El Saladar and Los Judios. * Rising above Alicante is an imposing medieval fortress called the Castillo of Santa Barbaral, you can rent a car and drive along the road down the castle. * The museum, housed within the castle, is renowned for it’s fascinating collection of papier-mache effigies that have been saved from the spectacular festival flames of Les Fogueres de Sant Joan which is held in Alicante at the end of June. * The Postiguet beach is in the city, at the foot of Santa Bárbara castle and alongside the port and the Explanada . There are zones reserved for playing sports such as beach volleyball. It is renowned for the quality of its sand, its palm tree boardwalk and its cafes. * The Island of Tabarca . The island has a rich history that is evident in its ancient fortifications, 18th century church and castle of San José. 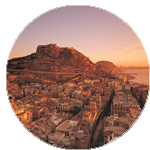 * Many people choose to rent a car to travel on their own on arrival to Alicante . It allows them visit numerous fisher villages and enjoy its cuisine based on fish and rice. Rice is the star ingredient of its local dishes. Within 30 minunes by car you will be at Guadalest town, this village of barely 200 inhabitants is set in a picturesque valley surrounded by the highest mountains in the Province of Alicante .